Hyundai is widely viewed as one of the most aggressive car companies in the world. In global industry terms, it's relatively young, having designed and sold its first car only in 1975. But the South Korean company has ambitious plans, including many on the green-car front; it wants to have the industry's second-widest array of green cars, presumably after Toyota, which sells more than two dozen hybrids globally. The 2016 Hyundai Sonata Hybrid is its third iteration on a hybrid mid-size sedan, and the Plug-In Hybrid model that accompanies it is the first for the Sonata lineup--all in the past six years. The first 2011 Sonata Hybrid wasn't a very pleasant car to drive, and after just two years, Hyundai updated its control software and made some hardware tweaks. That made it into a much more pleasant vehicle, within the limits of a single-motor full hybrid system. And Hyundai has always said that it designs its hybrids not only for fuel efficiency in low-speed and around-town operation, but also at highway speeds, which represent more than half of the miles covered by U.S. drivers (unlike in other countries). 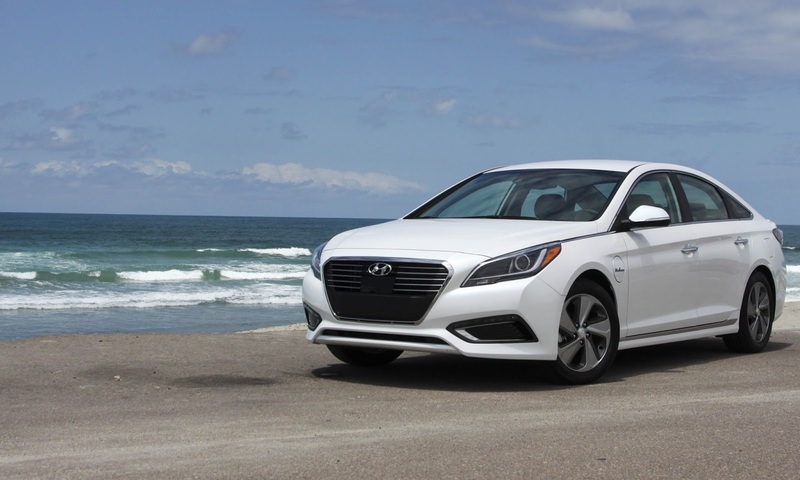 The company waited an extra year after the launch of the 2015 Hyundai Sonata to launch the latest hybrid version (last year's Sonata Hybrid was a carryover), and our First Drive of the Sonata Hybrid and Plug-In Hybrid models indicates that it was worth the wait. Like the earlier versions, the hybrid and plug-in hybrid Sonatas have unique frontal styling to set them apart from higher-volume garden variety versions--in this case, a larger and deeper grille. The Sonata Hybrid is rated at either 41 or 42 mpg combined, depending on trim level, and unlike Toyota and Ford hybrids, its highway fuel-economy ratings are higher than its city ratings. It competes with the new Chevrolet Malibu Hybrid (projected 47 mpg combined), the Ford Fusion Hybrid (42 mpg combined), the carryover Kia Optima Hybrid (37 or 38 mpg combined) from its sister company, and the long-established Toyota Camry Hybrid (40 or 41 mpg combined). The Sonata Plug-In Hybrid (40 mpg combined, 27 miles of electric range) competes only with the Ford Fusion Energi (38 mpg combined, 20 miles of electric range)--and perhaps the smaller 2016 Chevrolet Volt (42 mpg combined, 53 miles of electric range). Like all plug-in hybrids except the Volt, the plug-in Sonata can't do its entire electric range on battery power alone. Still, its 27-mile rating is higher than any other non-Volt plug-in hybrid in current production. Both models, said our reviewer Bengt Halvorson, drive better, get better gas mileage, and are more refined than the Sonata Hybrid they replaced. Given Toyota's 14-year head start on Hyundai in hybrid design and production, and Ford's seven-year lead, the company has made impressive strides over the relatively short time it's been selling hybrids. And its first plug-in hybrid offers far more electric range than did Toyota's sole plug-in Prius (though a new model of that car is coming for 2017). Hyundai and Kia together intend to have nine separate advanced technology models on sale by the 2018 model year, including the upcoming Hyundai Ioniq "Prius fighter" (and a Kia model as well), which will come in hybrid, plug-in hybrid, and battery-electric models. If the example of the two hybrid 2016 Sonata models is anything to go by, they'll be not only fully competitive but might even outdo other makers on some of their specs. For that reason, the 2016 Hyundai Sonata Hybrid and Plug-In Hybrid together are one of the five finalists for our 2016 Best Car To Buy award.